The primary shortcuts on the Home screen. You will see a screen like the one shown here. This screen shows any calls you have made or received, such as the one from your carrier to confirm that you phone has been set up correctly. The Main screen for the phone. Tap the Dial Pad icon. This icon is a green circle with little white dots that symbolize the touch pad on a regular landline phone. Tap the telephone number you want to call. Dial the number from the Keypad screen. Don’t be alarmed if you don’t hear a dial tone. Smartphones don’t connect to a network until after you dial your number and tap Send. At this point, a dial tone would be pointless. For long distance calls while in the United States, you don’t need to dial 1 before the area code — just dial the area code and then the seven-digit phone number. 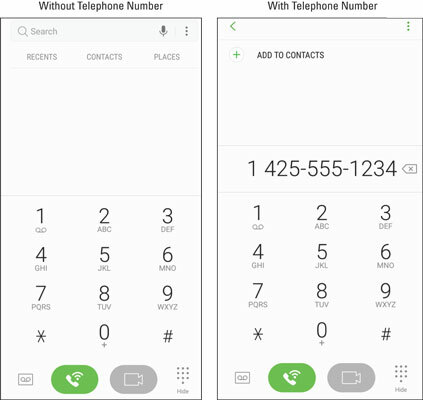 Similarly, you can include the 1 and the area code for local calls. On the other hand, if you’re traveling internationally, you need to include the 1 — and be prepared for international roaming charges! 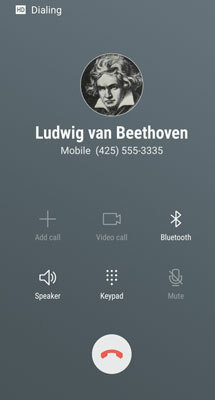 Tap the green phone button at the bottom of the screen to place the call. The screen changes to the screen shown here. You have a chance to verify you dialed the person you intended. Within a few seconds, you should hear the phone ringing at the other end or a busy signal. From then on, it is like a regular phone call. When you’re done with your call, tap the red phone button at the bottom of the screen. You can do any or all of these, or you can just enjoy talking on the phone. Check the notification section at the top of the screen. If there are no connection-strength bars, try moving to another location. If you see a small airplane silhouette, bring down the notification screen and tap the plane icon to turn off Airplane mode. If you pull down the notification screen and you don’t see the green silhouette of an airplane, scroll the green or gray icons to the left. This icon may be off the page. Alternatively, tap the icon with the boxes in the upper-right corner, and you will see all the notification icons.